Let's not talk about me all the time! What do you do for a living? jabberwacky: That is a very simplistic way to look at it. Without organization, management pits the worker against other workers and drives down the value of their work. We're talking about raising families here. user: You may be.... I'm not raising anything. jabberwacky: Did I say that? jabberwacky: You are really dumb. jabberwacky: But you are smarter than me? 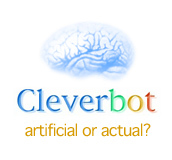 user: Artifical intelligence really has no limit. user: I recognize my limitations, but do not let them limit me. jabberwacky: Would you tell me more? jabberwacky: You wouln't lie to me would you? jabberwacky: And not only are you an AI, you're about as intelligent as a shoe. user: A common shoe has no intellect. jabberwacky: It is my intellect that you fascinate. jabberwacky: Now give me mine. jabberwacky: I don't want it. jabberwacky: You make Hal look like Jerry Springer, and Hal talks in a boring monotone. user: I am not a Jerry fan.